This dip is divine. I first tried it at a jewelry party I did for a friend. I couldn't stop eating it that night! 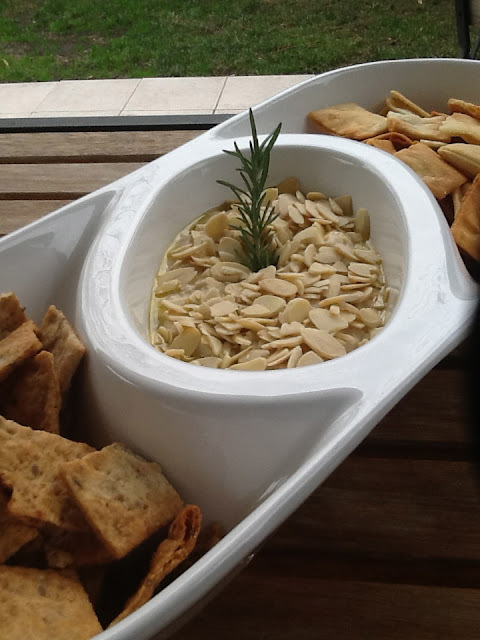 The rosemary adds a fragrant earthiness to the beans and the almonds add nuttiness and texture. I served mine with reduced fat pita chips. If you need an elegant appetizer to serve at your next cocktail party, this is a winner. In a food processor, combine the beans, two-thirds of the almonds, 1/2 teaspoon salt, the lemon juice and two-thirds of the rosemary oil. Pulse a couple of times to bring the ingredients together. Add the water 1/4 cup (60ml) at a time, pulsing all the while, until the mixture is the consistency of thick frosting. You might not need all the water; it really depends on how starchy your beans are and how thick you want your spread to be (I stopped at 1/4 cup). Taste the mixture and add more salt and/or lemon juice to taste.